Lately people have been buzzing about how Miley Cyrus twerked on stage at a Juicy J concert and about her latest song produced by Mike Will Made It. At first, I was upset that she received so much attention. I saw news anchors on television discussing her twerking, and I thought, “Why the F is this news?” So I was hesitant to write this post. Yet, with all the comments about Milley 2.0 “trying to act black” and “being ratchet,” I felt the need to say something about her new tactic to increase the hype of her upcoming album. Unlike many people who are quick to shame Miley Cyrus for her recent twerking obsession and her new sound, which claims that she is “bout that life,” I won’t go there. Let her twerk if she wants to—but don’t you dare applaud her for twerking and then turn around and criticize all the black women who twerk. I have other issues with little Ms. Party in the USA. 1) Stop referring to hip hop and other music from black artists as “hood” music. In a recent interview with Billboard, she claimed that she loved “hood” music. I think most of us know (but someone needs to let Miley know) that the majority of commercial hip hop sales are from suburban areas and that about 60% of those consumers are white. 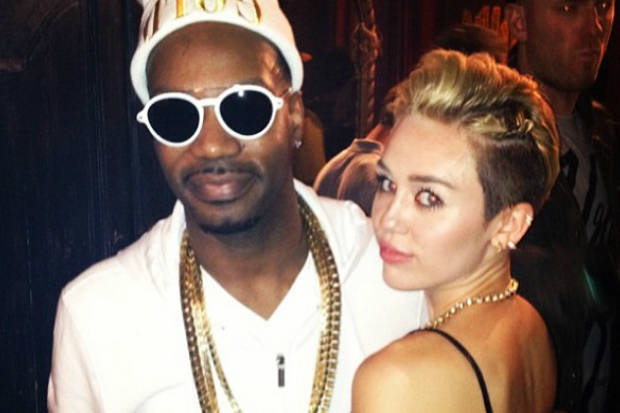 * Miley, sweetie, you aren’t special because you like Juicy J—you’re part of the 60%. But hey, maybe some of that 60% who bump fictitious “hood” music, yet haven’t gone beyond their white picket fences may pick up her album. Maybe Miley’s onto something. First of all… No. It wasn’t. Think about it—would it be adorable if it were Willow Smith or Gabby Douglas? Is it cute when Nicki Minaj twerks? No! Many people have internalized a double standard and would criticize young black women for being overly sexual. Blogger Necole Betchie wrote that Miley is “definitely carrying around a ‘ratchet’ card somewhere in her back pocket.” Yes, she may be carrying the card, but she can use or toss it as needed. Others don’t have that luxury. According to writer Sesali Bowen, many people (mainly black women) are labeled ratchet because of their poverty, clothing choices, and actions, and they cannot shake the label as easily. So be careful who you call ratchet. 3) Do what you do. Let Miley be Miley. Hanna Montana, Miley 2.0, rebel Disney star, whatever. If you don’t like her, don’t listen to her and don’t talk about her. That being said, I’m not going to say anything else about her. But I think it’s imperative that we think about and discuss double standards, white privilege, and what is acceptable for certain women to do but not others. If you don’t feel like reading up on cultural appropriation, check out “White Privilege” by rapper Macklemore. His song is open and honest about how white musicians fit into black music. 2: extremely or deplorably bad or distressing <a wretched accident, 3a : being or appearing mean, miserable, or contemptible b : very poor in quality or ability : inferior . Using this word as a “cool” urban word of degredation, is the equivalent of using the word “ax” instead of “ask”. When oh when will we learn. Yes, You’re right. Language, vocabulary, and definitions are so powerful and important. Your definition of ratchet is just what Sesali Bowen discussed in her article. Ratchet is a very gendered and demeaning term that we all should probably scrap from our vocabulary. In addition, I think it’s also important that we look at and understand how people often define (or incorrectly define) “hood music.” Because unfortunately that says projects negative ideas about our culture, just like the term ratchet.